Temple run is among the first few android games which had drown people’s interest in android games. It is known as the popular endless running android game among users. There are many different stages and level in this game which is just perfect for game lovers, they just love to play it. Many of the users spend hours playing this game. As I have already told you that Temple run was originally developed for mobile devices. But, don’t worry you can still play this awesome game on your computer. There are many methods for doing this. 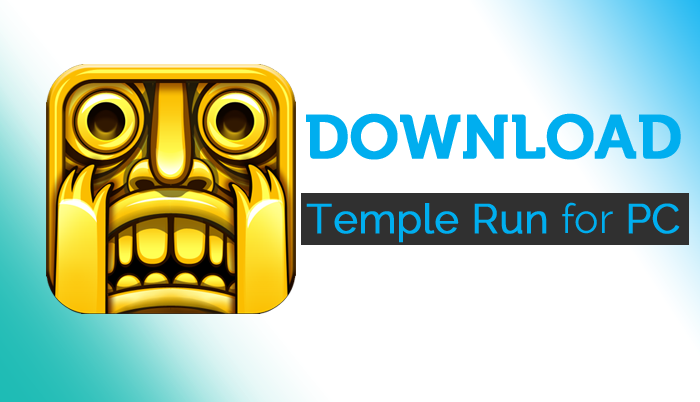 However, I know about 3 methods which will help you to run Temple run game on your PC. All these methods have a common thing – in all of these methods we will use an android emulator software. In simple language an android emulator is a software which helps you to run android games on your computer. There are many android emulators available on the web. But I have used top 2 best android emulators here (below in all methods). So, read about all 3 methods and check which method you can use. Go ahead and jump into the tutorial. 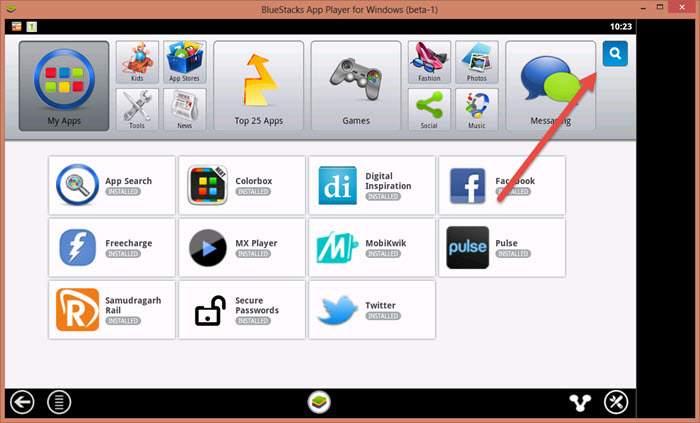 In this first method we will use BlueStacks android emulator. BlueStacks is world’s best android emulator. 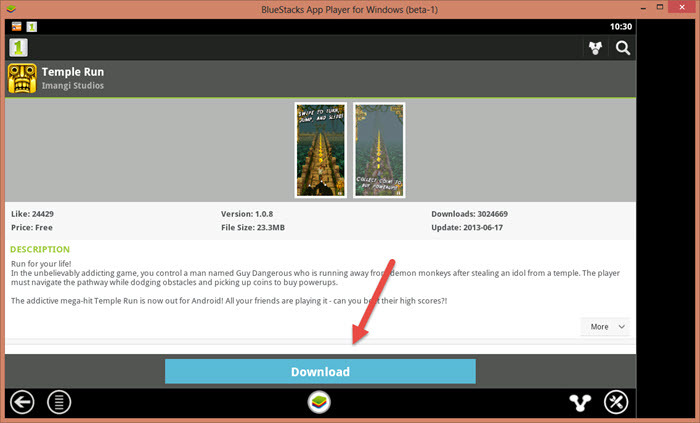 So read how to use BlueStacks for downloading Temple run for PC below. • First download and install BlueStacks on your computer (download link available below). In case you already have it installed on your computer you can skip this step and move to next step. • Now open BlueStacks and click on the search icon and search for Temple run. You will see the game in search results, just click on the real Temple run game. • Now in the now window you will see a green button for installing it. • Now click on that button for start downloading temple run on your computer. Depending on your internet speed downloading will take some time. Now enjoy playing the game on your computer. Yeah, you can directly download the Apk file of Template run and install it on your computer. But again for installing it you need BlueStacks. So, if you already don’t have BlueStacks installed on your computer download it and install it first. After doing so you can check the steps below to find out how to download temple run Apk on your computer. It’s not easy to download any android software’s Apk file on computer. Because there are plenty of websites, but you can easily get lost in the ocean of tons of websites. So below is an awesome method for downloading temple run Apk file on your computer. We can use this same method for downloading any android game Apk file on your computer. Here we will use a service called Online Google play downloader and download the software’s Apk file directly form Google play though this service. • Now click on generate download URL button and you can see with in few second the download link will be generated, click on that generated download button to start downloading. After you download the Apk file click twice on that to install it on your computer. Now enjoy playing the game and in case you still don’t find any appropriate method for you please check the last method below. You will surely find what you are looking for. This is the last method which can help you for downloading temple run on your computer, here we will use another android emulator software called YouWave. It’s a pretty good software, of course, not as good as BlueStacks but you can surely trust it when trying to install android games on your computer. Follow the steps below to find out how to download and install Temple run on computer using YouWave. • Search for Temple run on Google pay and when you find it, just click on it to open and after that click on install button to install it. Google play may ask you to sign in, if then sign in with your Google account before download temple run. Now as you know how to download and install Temple run on your computer enjoy playing it. And stay tuned with us for more awesome updates.